If you want to figure out how long it will take to double your money in an investment, you use the “Rule of 72.” But income investors can put this rule to work, too, to figure out just how quickly their dividends will pile up. I’ll show you how – and I’ll show you five dividend stocks that are on pace to double their dividends in just seven years. 72 / compound annual interest rate = # of years to double your investment. So let’s say the S&P 500 returns an average of 8% a year. 72 / 8 = 9. That means it should take about nine years for someone holding a market fund such as the SPDR S&P 500 ETF (SPY) or Vanguard S&P 500 ETF (VOO) to double their money. Obviously, I aim to do better. But you can also use this equation to figure out how quickly your dividends should grow over time, which will help you figure out your eventual yield on cost. For instance, say a stock yields just 3% now, but is on pace to double its dividend in just five years, you can essentially plan for a much healthier 6% yield on cost in a short amount of time. That would be an income play you and I could get behind! Let’s use the S&P 500 as an example again. The index has grown its dividend at an average of 8.2% per year over the past five years. The math isn’t much different – it’ll take just under a decade for the S&P 500 to double the dividends it pays out. That’s a little sluggish for my tastes, especially considering there are numerous dividend payers that are acting with a lot more urgency. Today, I’m going to point you in the direction of five stocks whose payouts are booming. These firms have been boosting their payouts by an average of at least 10% every single year (and in many cases more) – putting them on pace to double their dividends in just seven years or less! American information technology and management firm Booz Allen Hamilton (BAH) isn’t the first, second or hundredth stock on most investors’ lists. But it’s worth a look, both for its array of business arms and the stellar results they’re driving. Booz Allen Hamilton is perhaps best known for its consulting business, which has been used historically for tasks ranging from World War II preparations to the merger of the National Football League with the AFL. BAH also deals in analytics, digital solutions, cybersecurity and even engineering. All told, Booz Allen has more than 25,000 employees working across 400-plus locations in more than 20 countries. Nearly 70% of which hold security clearances, which speaks to its heavy ties to the government – in fact, the federal government was responsible for 97% of the company’s $6.2 billion in fiscal 2018 revenues. 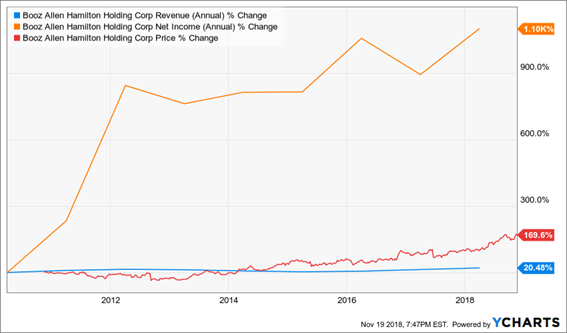 This has fueled a general uptrend in both revenues and net income since its 2010 IPO, which in turn have powered a very consistently growing dividend. The company improved its payout by a pair of pennies to 19 cents quarterly this year – a 12% improvement that’s not far off its five-year average dividend growth of roughly 14%. And that dividend isn’t even 30% of this year’s projected $2.64 in profits, which means the company has oodles of room to write larger checks for years to come. Credit card use isn’t new to you and me. In fact, plastic has been around so long that you probably think almost everyone uses a credit or debit card and that there’s not much market left to grow into. Wrong. Strategic research and consulting firm RBR’s “Global Payment Cards Data and Forecasts to 2022” report shows that global payment-card use grew 8% worldwide to 14 billion in 2016, and that number is expected to balloon by 22% to 17 billion by the year 2022. That’s fantastic news for MasterCard (MA) – the No. 2 player not just in the U.S., but in Europe, in Africa and in Latin America. The important thing to remember about Mastercard and rival Visa (V) is that while they seem like financial stocks, they’re really closer to being technology stocks – they’re not lenders, just payment processors. That means they need to constantly innovate to stay ahead of the game, which Mastercard has been doing via its recently announced Digital Commerce Solutions, which includes a plan to make all its cards support token authentication within two years, and a partnership with Southeast Asia’s Grab to offer virtual prepaid solutions for the ride-hailing company’s 110 million customers. MasterCard pulls in roughly $12.5 billion annually across its worldwide payments network. The company did nearly $1.5 trillion in gross dollar volume around the globe in the third quarter alone, across some 2.5 billion cards – up 4% year-over-year. MA has produced steady growth for years, which has translated into explosive growth in the dividend – to the tune of roughly 18% annually over the past half-decade. And its 25-cent quarterly dividend? That comes out to a mere 15% of this year’s projected earnings, which means MasterCard could triple its payout overnight and still have more payout headroom than most established dividend-paying blue chips. Better still: Shares have a lot of “catching up” to do with the payout. Vail Resorts (MTN) – a play on the “experience economy” – is essentially the future of ski lodges. Vail, as well as a few other groups, are buying up ski resorts, lodges and other operations across the U.S. and around the world, and bringing them under one brand to better serve wealthy customers whose particular destination tastes may change from time to time. Mountain: This entails the company’s premier mountain resorts, including the namesake Vail, as well as Breckenridge (Colorado), Northstar (Lake Tahoe, California), Perisher (Australia) and Whistler Blackcomb (Canada), among others. 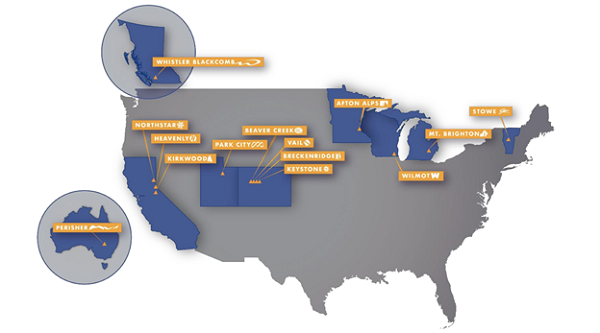 Lodging: Vail Resorts Hospitality owns several properties around its various resorts, including five RockResorts luxury hotels, as well as a National Park contract at Grand Teton National Park and an airport-to-resort transportation company, Colorado Mountain Express. Real Estate Development: Lastly, Vail Resorts Development Company helps plan, market and otherwise develop property around the resorts, including communities and private clubs. One of Vail’s biggest sources of growth is its “Season Pass,” which allows guests to use its various resorts, rather than tethering customers to one particular resort. Pass sales have grown at 13% annually on average since fiscal 2012, to more than 78,000 in FY2018. The result has been steady growth pretty much across the board, including free cash flow, which has improved every year since 2012 – from $57.1 million then to $338.6 million in FY2017. Vail has been generous with that cash, too, growing its dividend by nearly half every year on average over the past five years. Its current $1.47 quarterly dividend comes out to 75% of this year’s profits, but just 65% of next year’s. 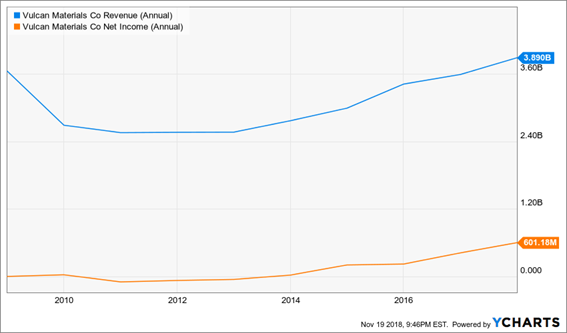 Don’t expect nearly 50% dividend expansion going forward, but as long as MTN’s earnings swell like they’re expected to, Vail Resorts should be a dividend growth machine. Southwest Airlines (LUV) is, as I’ve said before, a “breath of fresh air” in the airline industry. In a business that seems to pride itself on kicking puppies and pushing down old ladies, Southwest has set itself apart on the most bizarre of concepts: Treating humans like humans. This year alone, Southwest has topped J.D. Power’s study for customer service among low-cost airlines in North America, took home four TripAdvisor Travelers’ Choice awards and was No. 2 on Indeed’s top-rated workplaces. Of course, being nice isn’t everything. You have to make money. And Southwest makes money. The airline has been profitable for 45 consecutive years despite its strong price-competitiveness. In the third quarter, LUV brought in $615 million in earnings – its best Q3 in company history. That same quarter, the company returned $591 million to shareholders via share repurchases and buybacks. The majority of that ($500 million) was repurchases, but LUV is far, far, far from a distribution slouch. 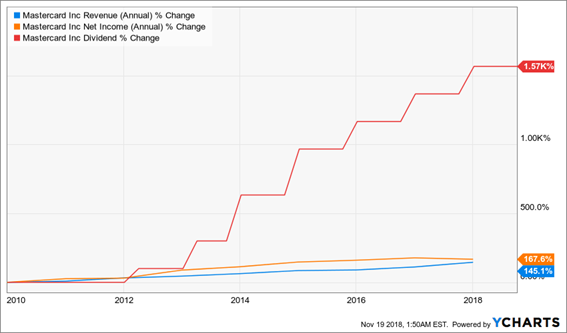 Southwest has pumped up its payout from a mere penny per share at the beginning of 2013 to 16 cents as of this year’s distribution – itself a hefty 28% improvement. And at a mere 15% of this year’s projected profits, the sky’s the limit on future payout hikes. 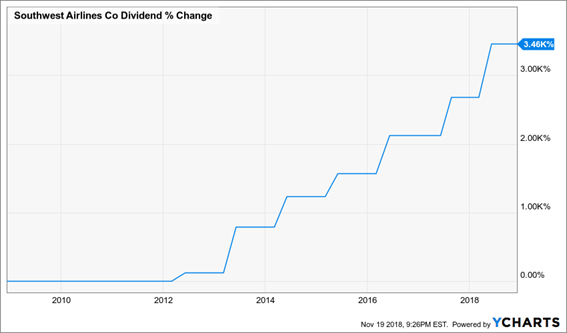 I’m not sure what you think of when you think about a company that has been able to nearly double its dividend every year on average for a half-decade … but it’s probably not Vulcan Materials (VMC). Vulcan Materials produces the stuff construction is made of: crushed stone, sand, gravel, asphalt and ready-mixed concrete. Vulcan is the king of what it does – it’s the largest aggregates producer in the U.S. And the company says that “75% of the U.S. population growth from 2010 to 2020 is projected to occur in Vulcan-served states,” meaning it’s perfectly positioned to capture the lions’ share of building projects as time goes on. The company’s third-quarter report showed just what kinds of tailwinds VMC has been riding to turn the business around from its struggles in the Great Recession. Vulcan’s daily shipping rates were up 6% year-over-year, pricing momentum improved by 3% and unit cost of sales actually declined 2% despite a 28% spike in the cost of diesel. Best of all, cash gross profits per ton improved 6% year-over-year. That money is going straight into investors’ pockets. The company has electrified its payout from a penny per share back in 2013 to a current 28 cents per share – and even then, the company isn’t even doling out 30% of its profits in dividends. Vulcan isn’t your typical dividend play, but then again, we don’t want typical – we want extraordinary. These stocks will inflate your dividends faster than almost any other plays on Wall Street, but why wait years for thick dividends when you can get them today? I’m not talking about the slightly better yields you’ll find in slow-growth stocks like consumer staples Coca-Cola (KO) and Procter & Gamble (PG). You know these tired plays: They’ve chugged along for years, so investors hang on to them hoping to squeeze out 3% yields and a few percentage points a year in growth. But you can do better than these middling yields from these middling blue chips. Much, much better. In fact, this is one of the best income opportunities I’ve researched in years. These stocks have extremely specialized businesses that allow them to do the seemingly impossible: They can actually wring high-single-digit dividends from some of the most skinflint companies in America. One of my Dividend Conversion Machines takes Visa’s 0.6% payouts and magnifies it to 9.2%. Another one can take Google’s 0% and produce a 9.4% yield out of thin air. Go to your trading account. Instead of entering a buy order for, say, Disney by entering the stock’s “DIS” symbol, enter the 3-letter code for one of my 4 Dividend Conversion Machines instead. Instead of getting Disney’s 1.6% dividend, start collecting an 8%+ income stream! The incredible investments I’m going to show you in just a second are 100% as safe as investing in “stodgy” blue chips – except you get retirement-enhancing dividends and BIG upside too! In fact, they even have another leg up on traditional blue chips: They pay out their dividends monthly, which is ideal for retirees who need that income to pay their bills – and ideal for investors planning for retirement because those dividends will compound even faster! Let me show you how to reap 28% in annual returns from miserly blue chips today. Click here and I’ll introduce you to these four “Dividend Conversion Machines,” including names, tickers, buy prices and full analyses – AND throw in three other income-generating bonus reports – all for absolutely NO COST to you.